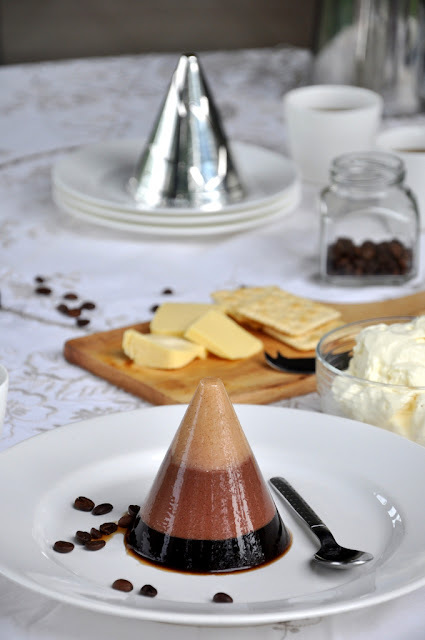 3 in 1 Jelly: top layer of creamy Sabah Tea, middle layer of creamy cocoa powder and bottom layer of creamy Sabah coffee. When I was growing up, kids didn't have birthday cakes because nobody had ovens and there were hardly any bakeries in town (this was Borneo remember). I don't know what other families did about birthday cakes but my mom made agar cakes for our birthdays. 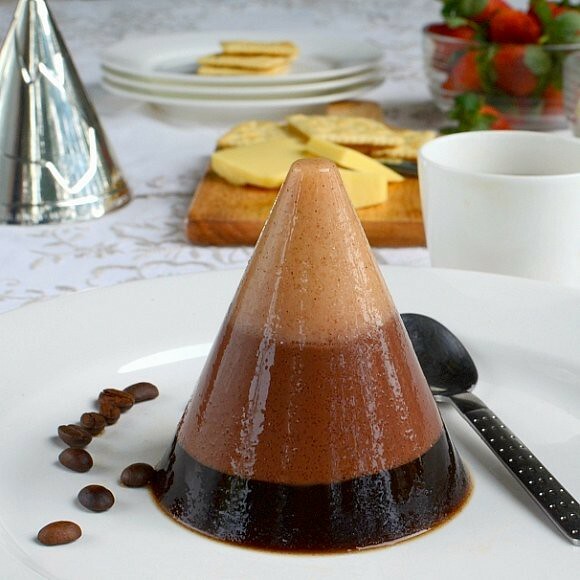 Mom's agar cakes were made in a round metal bowl with Ovaltine or Milo, and sometimes with fresh coconut milk. Match sticks were used instead of candles, a sign of Mom's creativity. Simple as they were, we loved those agar cakes. Kids then weren't showered with presents and constant encouragement. An agar birthday cake and a whole chicken drumstick (on non-birthdays, the drumsticks are chopped up to share) and I was the happiest person in the world. Our wants were that simple. Mom doesn't even remember those agar cakes now but my siblings and I do. The agar I'm posting today for Royal Selangor Pewter's Jellyriffic! challenge is inspired by my mom's agar cakes and by the tri-color coffee or tea lattes you can still order in hotels and country clubs. I've used three main beverages: coffee, tea and cocoa, all of which are grown in Sabah. 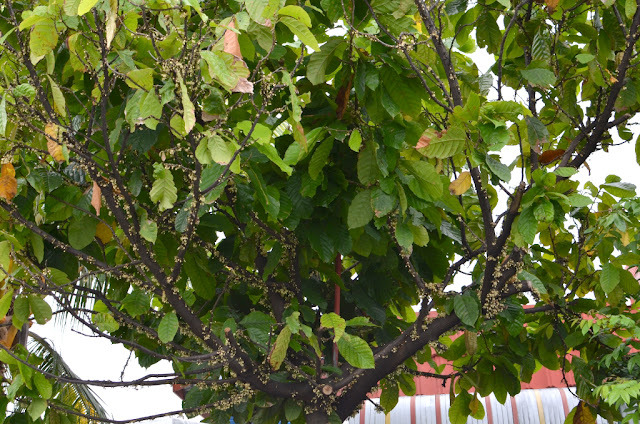 There are so many flowers on the branches of this cocoa tree that it looks like it is infected by some kind of fungus. I went to the market today to get fresh grounded coffee and the aroma was just wonderful. For many Sabahans, only thick Tenom coffee makes the cut which is why coffee shops are thriving while Starbucks and other chain coffee companies aren't doing well here. Sabah Tea is grown on the highlands of Mt Kinabalu. 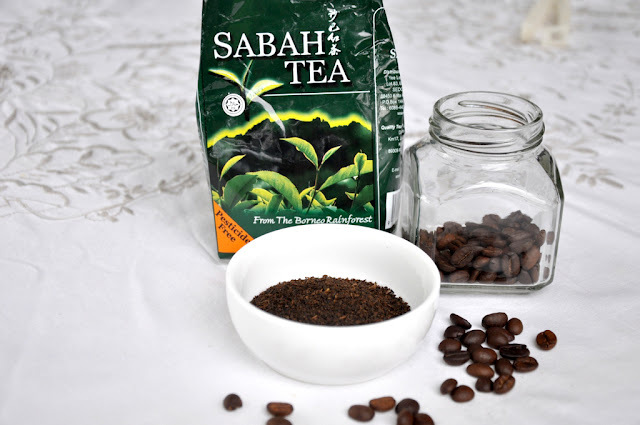 If you have been to Sabah, chances are you've grabbed a few packets of Sabah Tea to bring home. This is an easy jelly to make and the ingredients are found in most kitchens. The top layer was made with tea and cream (or even better, fresh thick coconut milk), the middle layer with cocoa and cream (or fresh thick coconut milk) and the last layer was plain strong coffee. I wanted the black coffee to stand out but you can add cream (or you know what) if the graduation in colors doesn't matter to you. Update: a reader suggested using gula melaka and that's a great idea because gula melaka tastes better than ordinary sugar. Thanks, Fieee, and I changed the name of this agar to "3 In 1" because of your comment. My daughter (who's back for a visit and gave me a crash course in Photoshop) and I set the table on our patio for the photo shoot this afternoon. We sat down after the shoot, dug into the agar and were delighted with it. The agar was firm and the flavors of each layer, though distinct, went well together. The extra cream was not even needed. The agar is quite firm and needs to be cut up for serving and eaten with a fork so use gelatine powder instead if you are going to eat it with a spoon. Coffee, tea or cocoa or all three anyone? 1. Make tea with the water, sieve to remove the tea leaves. Put the tea into a small pot. Mix the agar powder and the sugar well and add to the tea, stirring well. Heat until the agar and sugar is dissolved. If the agar is too thick, add a tbsp of water. Remove from the fire, stir in the cream until well blended. Work quickly because agar sets almost instantly. 2. Rinse and place the Nick Munro jelly mould into a mug. Pour the tea agar jelly through a sieve into the mould. You can work on the next layer straightaway as the agar sets quickly. 1. Mix the sugar with the agar powder. Heat the water in a small pot, add the cocoa powder and the agar-sugar mixture. Stir well to dissolve the agar and sugar. 2. Remove from heat, add the dairy cream and sieve over the first layer of agar. 1. Mix the sugar and the agar together well. Heat the water until boiling, remove from heat and add the coffee powder. Stir well, leave to develop the flavor. 2. Sieve the coffee into a small pot, sprinkle the sugar-agar mixture over and heat to dissolve, stirring well. Remove from heat and add the cream, stirring well. Pour onto the middle layer. When cool, leave to chill in the fridge. Note: I made this agar very firm to last the photo shoot and also because we like the bite of firm agar. If you prefer a softer agar, reduce the agar powder by half or less than half. Agar is using eaten with a fork or even hands. If you prefer to use spoons, substitute the agar powder with gelatine powder, using the same amount for a firm jelly and reduce it for a softer one. Nice. This reminds me of the 3-layered tea served in some kopitiams. Made of tea, milk and Gula Melaka. Perhaps you could make a jelly from that combination? Just a little suggestion. PS: This is my favourite post. Appreciate the fact that all the 3 main ingredients used in this recipe are produced in Sabah. An easy to make dessert which I intend to show off in my next home party. Thanks! Coffee and cocoa - Yum! 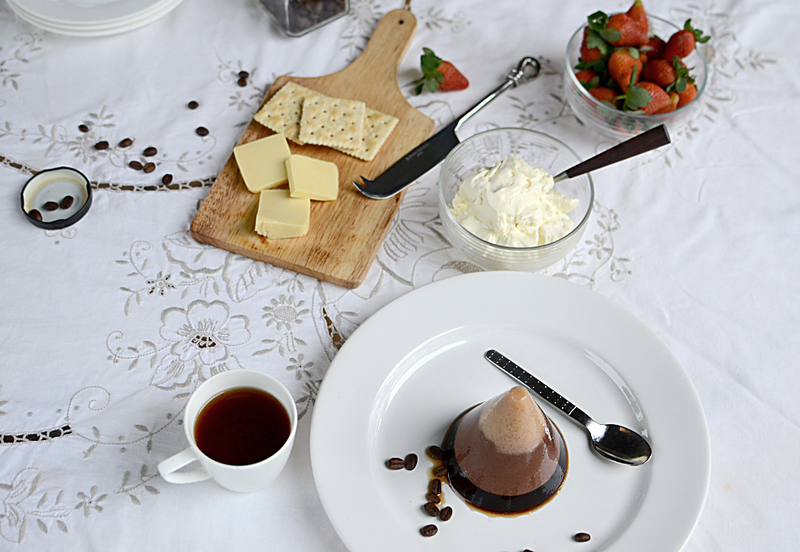 Coffee and cocoa - great combination. My thinking is same like Lady G! Great photos thought. Terri, you always made something wonderful that all us can make at home with the ingredients found at home. Something, we love to share with our children. I adore coffee so this sounds like a real treat for me! Nice 3-in-1. Looks so appetising. Love anything that looks brown and chocoltey..NICE!!! Phew, my fren. Your Jellies are very inspiring. Keep going. Love your 3 in 1 idea and I love the combination! Terri, "3 in 1 jelly is so local.I wanted to go to your house to try your creation!. 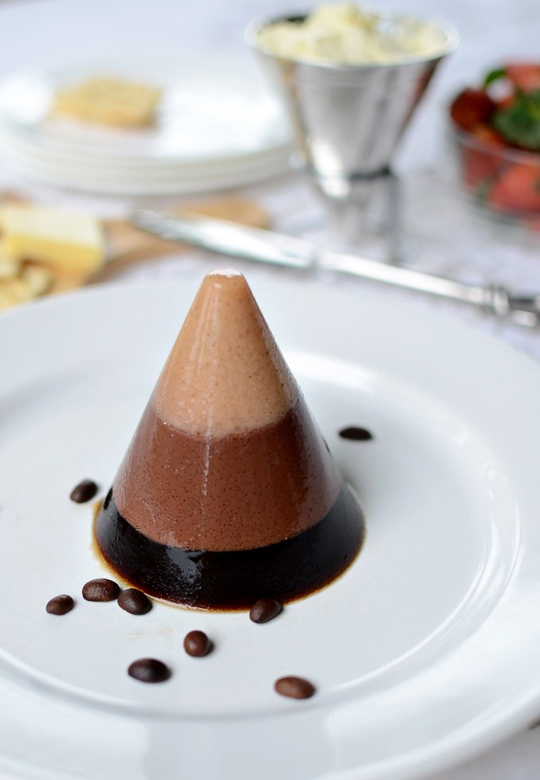 Love this brilliant idea of playing around with drink flavours (and all coming from homeland) to create such a unique dessert with beautiful contrasting tones. Definitely a subject of conversation in any party! wow! !what a great combo!! I would like to try it! Great combination! Too bad I've stopped using coffee in my desserts since the boys came along! Now.THIS.is.SERIOUSLY.yummy!!!! Can I pleeeeease have some??!!! This is so creative! I can't imagine the tea and coffee mix. I so want to try it! And the simplicity of the layers is stunning. These 3 studies from big medical journals are sure to turn the traditional nutrition world around!